Nine holes sizes cover 16 functions for keeping tap drill bits and taps in alignment during use. This tool can be used with a hand-held drill motor and with hand held tapping tools. You can use it to drill tapping-size holes, then use it to tap the hole. 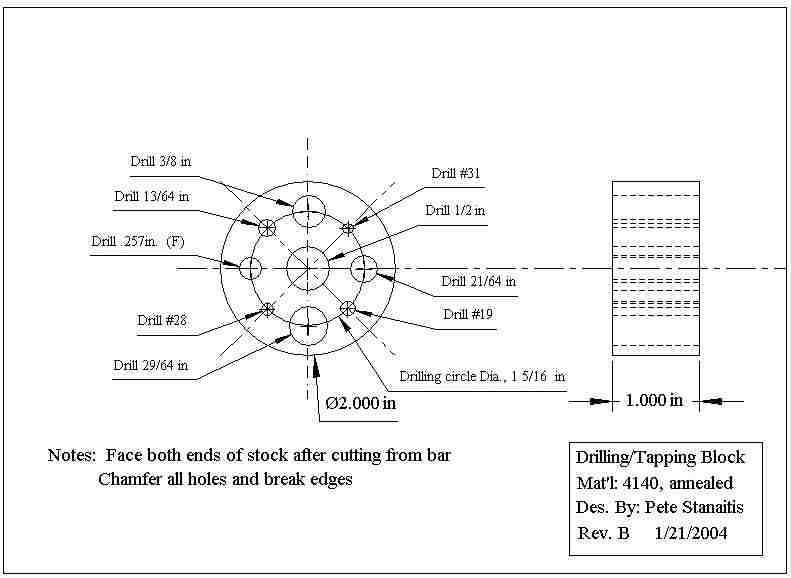 It also supports clearance-drill sizes for everything in the table below. I used 4140 alloy steel to make my tapping/drilling block, but you can use mild steel if you aren't going to be using it on a daily basis. To use it, simply select the hole that most closely fits the tap or drill bit needed. Hold the tool over the hole location	or hole to keep the tool vertical as either the tapping size hole is drilled	or as the hole is tapped. Chamfer all holes after drilling and before tapping. Once the tap has proceded about 1/4" into the material, this tool may be removed since there is	probably enough contact to keep the tap straight.